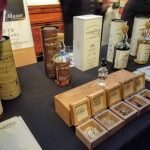 The Whisky Extravaganza, put on by the Scotch Malt Whisky Society of America, is one of the longest running whisky events in the United States. 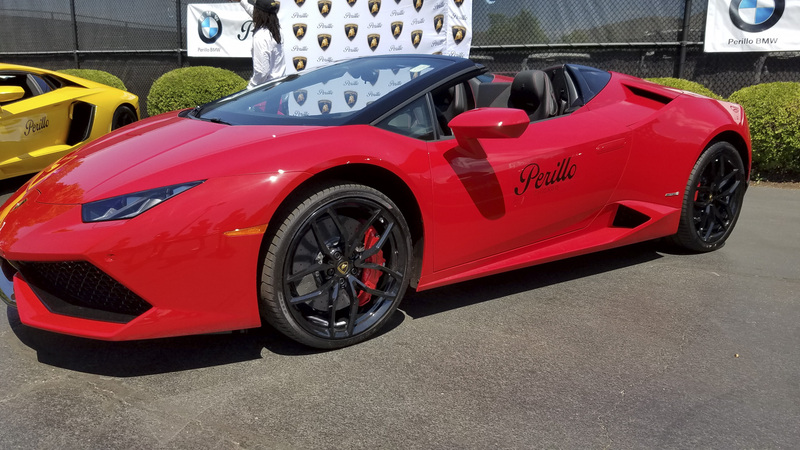 It runs in an impressive 10 cities across the country. Two thousand sixteen marked the 23rd year of the event. 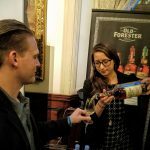 Chicago Bourbon was in attendance this year for the first time to see what the event is all about. 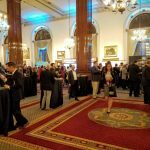 The historic Union League Club of Chicago hosted this years event. A 140 year old Chicago institution committed to our community, country, and culture. The ballroom, with it’s high ceilings and ornate appointments is adorned with stately paintings. 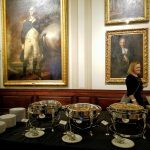 The perfect venue for a classy whisky event. 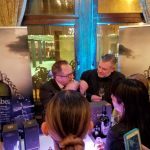 This years event featured more than 30 exhibitors pouring over 100 different whiskies, with a few vodkas and rums thrown in. 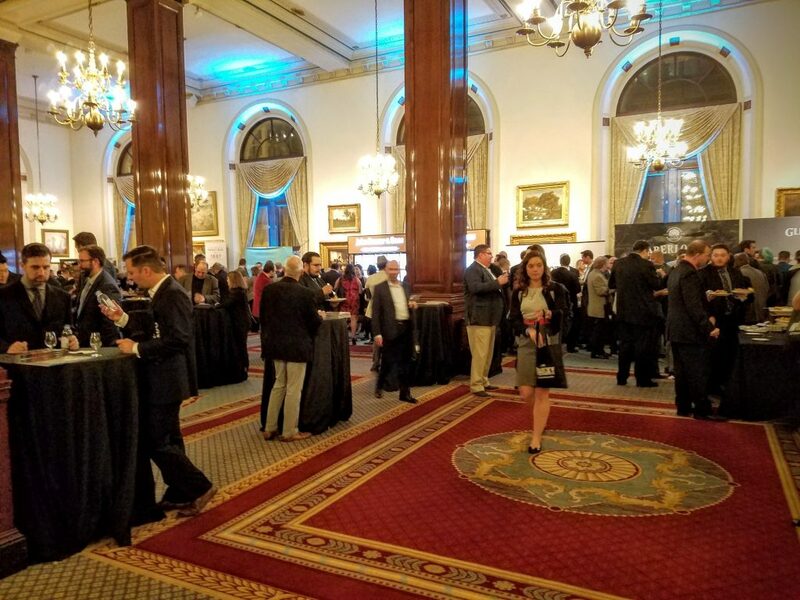 With the event running from 7:30pm to 9:30 there was plenty of time to make the rounds and stop back at a few favorites. 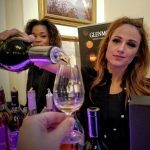 The event advertises unlimited pours and to us it seemed the brands were well stocked to back up that claim. But before getting to the whisky we laid down a solid base of delicious foods served buffet style. From steak sandwich sliders topped with caramelized onions to beet filled ravioli there was plenty of variety. 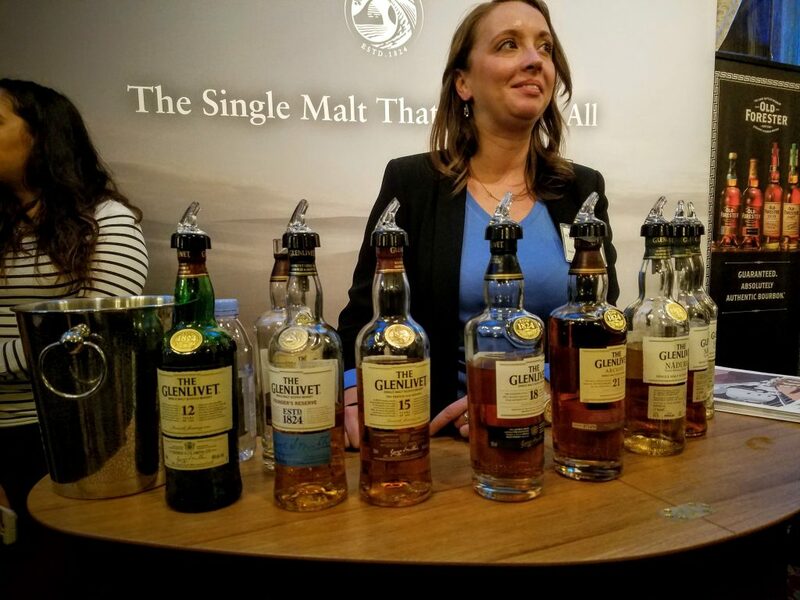 When tackling a tasting as formidable as the Whisky Extravaganza we’ve learned not to do it on an empty stomach. Or maybe we learned that in college…. Either way, on to the tasting! We hit the room starting clockwise and made some strategic decisions along the way to better enjoy the experience. We consider this key to any tasting and here is our free tip to you. 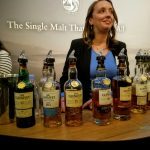 Save the peat heavy and high proof hooch for the end of the tasting. The last thing you want to do is start your night with an Ardbeg or Octomore. 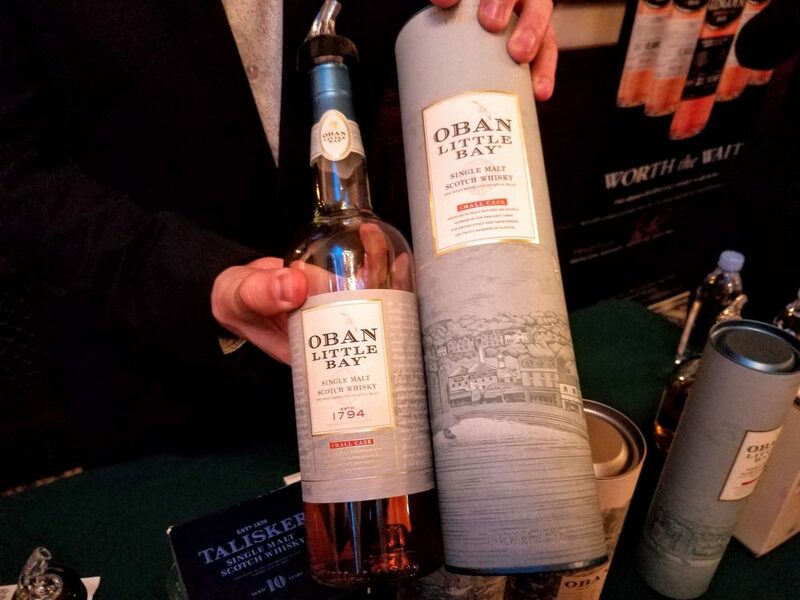 Both of these are awesome, and we enjoyed them at the Extravaganza, but they are heavily peated and will influence everything you taste for hours. 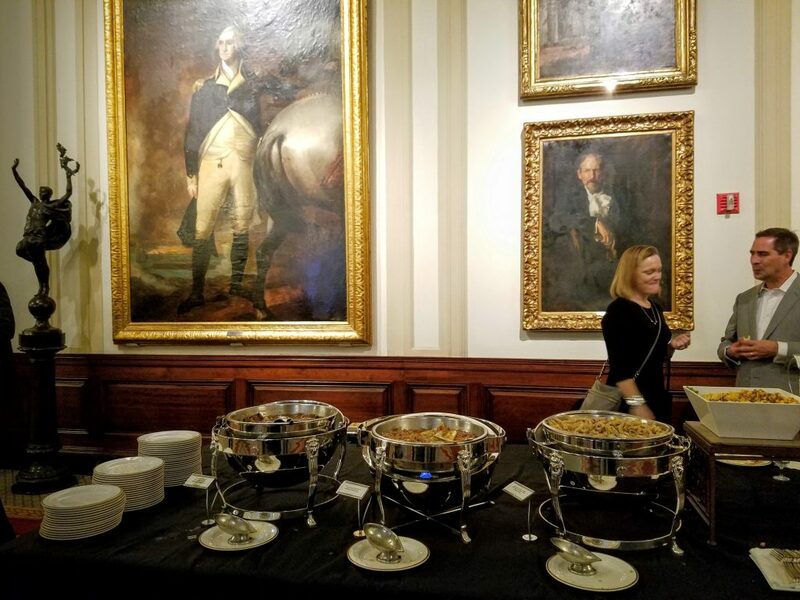 A little disclaimer, there were a total of two Bourbons to sample at the event. 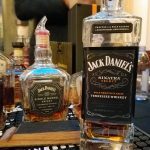 Old Forester and Woodford Reserve were in attendance and shared a booth with Jack Daniels, the “American Whiskey Corner” as we called it. What this did do was allow us to explore many Scotches we hadn’t tried before. Our first stop was Balvenie. 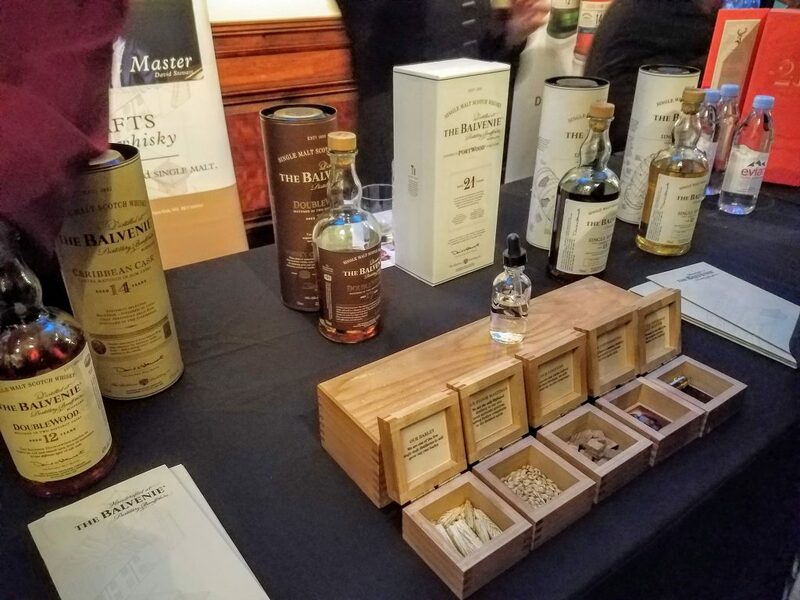 We attended a Balvenie tasting a few months ago hosted by our pal Ben at Single Malt Alliance. We found this to be an approachable place to start. 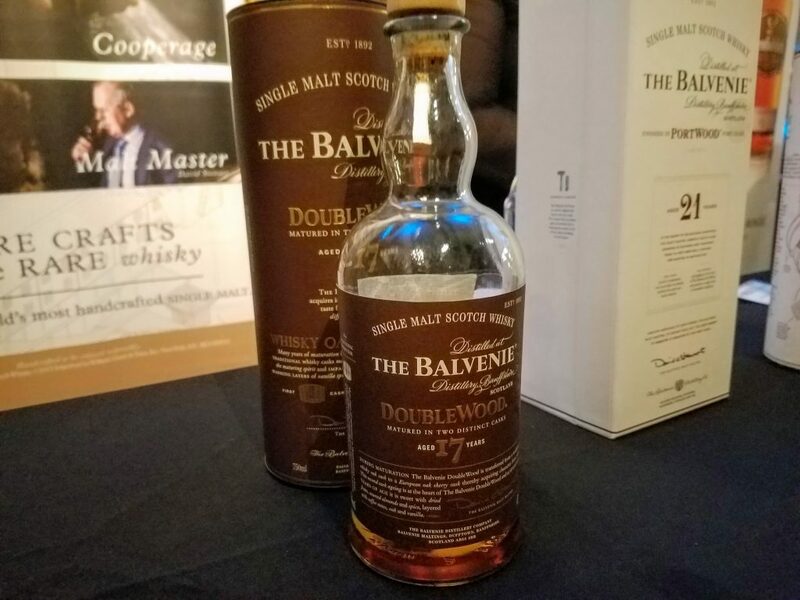 We dove right into the Balvenie PortWood 21 year old because….why not! Super smooth and creamy as expected from a whisky aged 21 years and finished in port wine casks. Next we hit the 12 year DoubleWood followed by the 17 year expression. Unsurprisingly we found the 17 to be much smoother and mellower than the 12. Both appropriately delicious at their respective price points. 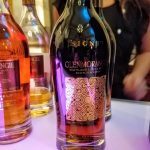 Glenmorangie was next where we sampled the 18 year Sherry Cask and the Glenmorangie Signet. 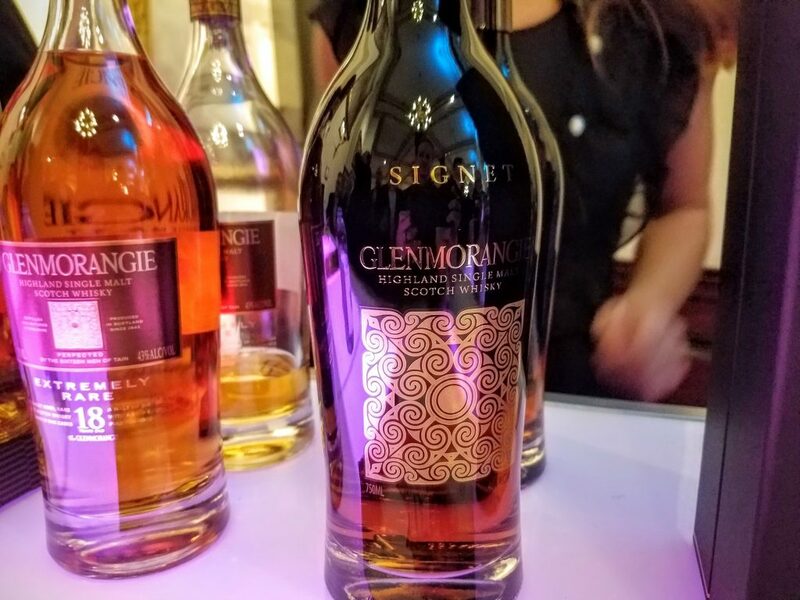 The Signet was a special treat being a Single Malt blend of 30+ year old whiskies distilled back when the malting was done on-site. 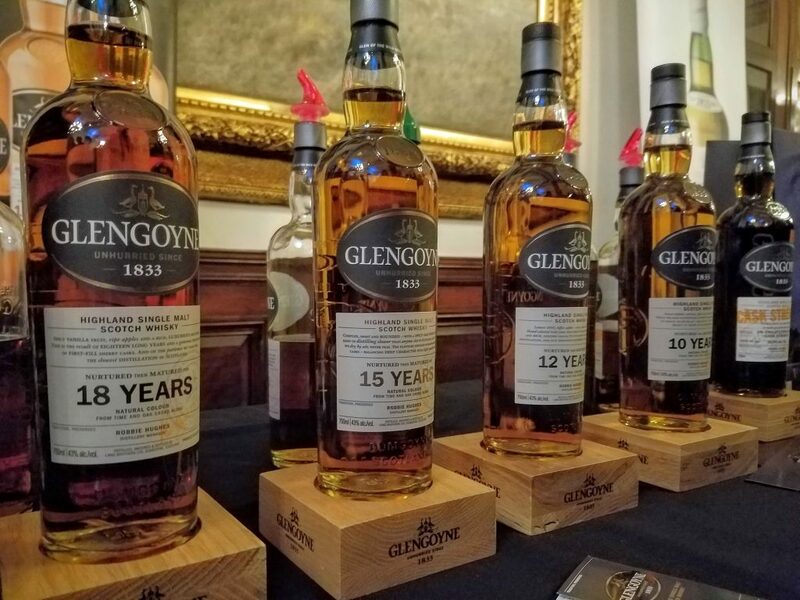 It’s described as the “richest whisky” in their collection and made with roasted ‘chocolate’ barley malt. 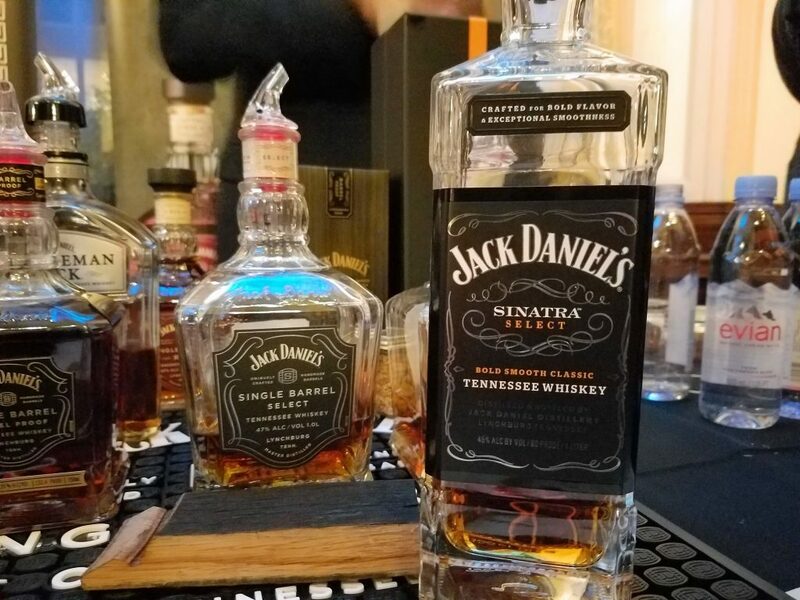 The bottle alone would be impressive behind any home bar. Strong notes of chocolate and roasted espresso came through in the nose. A rich velvety mouth feel complemented similar flavors and ended in a surprisingly welcome light finish. Around this time we bumped into our friend Marty Duffy, host of the recent 2016 Chicago Independent Spirits Expo. Marty had a Glencairn glass appropriately hanging from his neck on a custom harness. My first thought was whisky nerd! Quickly followed by a feeling of envy. 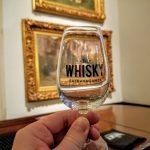 After chatting with him for a while about upcoming events, which you can find on the new Chicago Bourbon Events Calendar, we hit the whisky road once again. 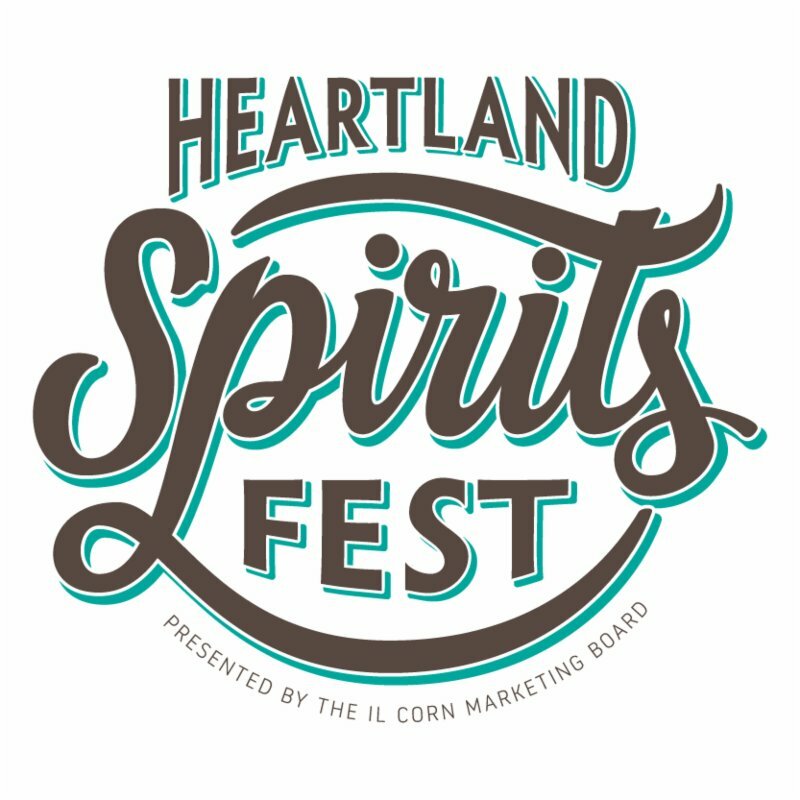 Read our coverage of the 2016 Independent Spirits Expo, click here! Bourbon was calling us and had to be next. 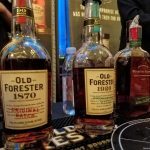 We walked up to the Old Forester and Woodford Reserve table to be greeted by Cathy Gassner, a local rep of both brands. Cathy was pouring a number of expressions but two of the newer ones caught our eye. 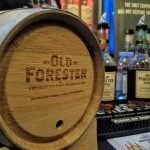 Old Forester Prohibition Style hit the Chicago market just two weeks before this event. 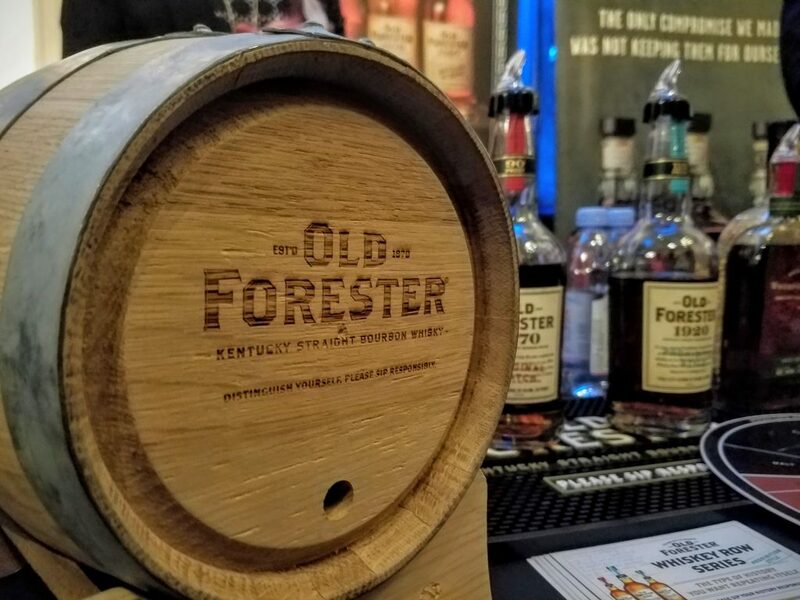 Barreled at 100 proof and bottled at 115 proof this bourbon is made from a recipe known to have been used by Old Forester during the prohibition era. Barreled and aged using a similar period inspired process. It’s both sweet and rich with marketing nosing notes of “An intense medley of cherry preserves, drippy caramel, dark chocolate, thickened maple syrup and seasoned oak spiciness.” And tasting notes including “Dark caramel…malt nuttiness…sweet graham cracker…”. 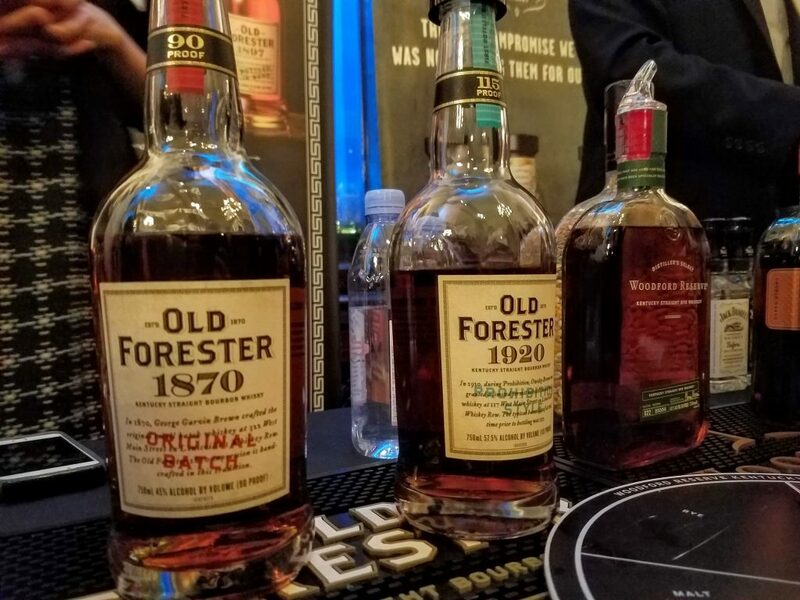 We followed this up with another installment from the Old Forester ‘Whiskey Row Series’, the 1870 Original Batch. 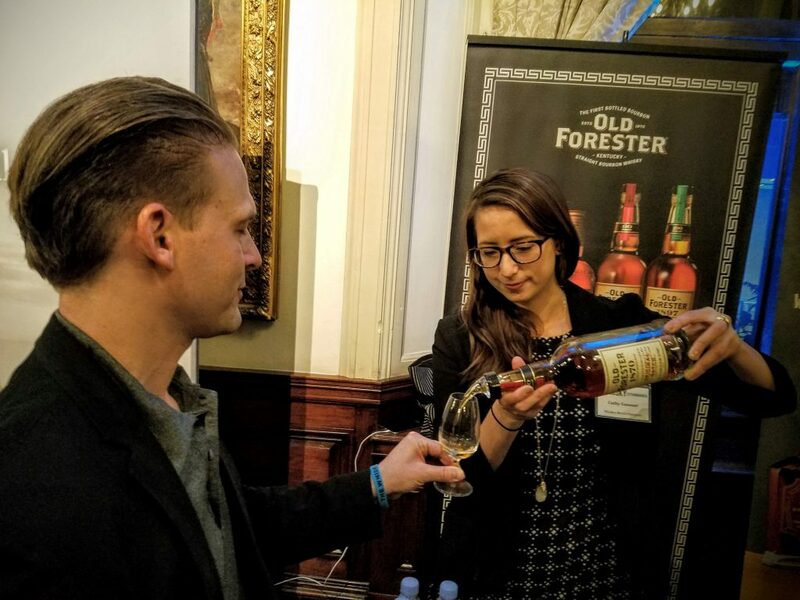 This one is a blend of barrels from three warehouses as a nod to the three source distilleries of the original Old Forester. A pretty cool idea that has produced a nice bourbon. 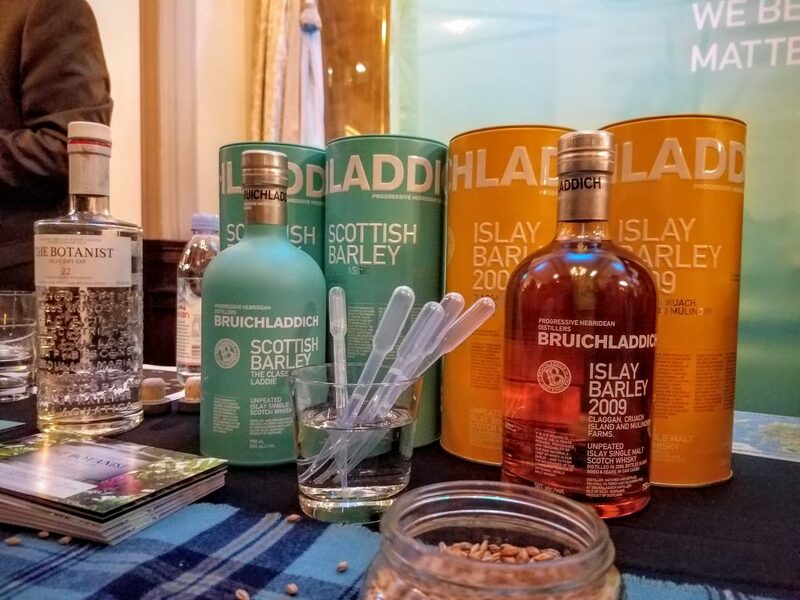 Finally, we put our method into practice one more time by switching between the Bruichladdich and Ardbeg booths. 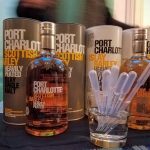 At Bruichladdich we sampled both of their unpeated whiskies. 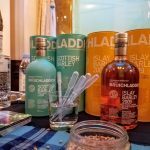 The rep told us the only difference being where the barley was grown, the ‘Classic Laddie’ uses barley grown on the mainland while the ‘Islay Barley 2009’ comes from island grown barley. This concept embodies the idea of terroir by showing consumers the difference in taste that the climate and soil can have on a spirit. 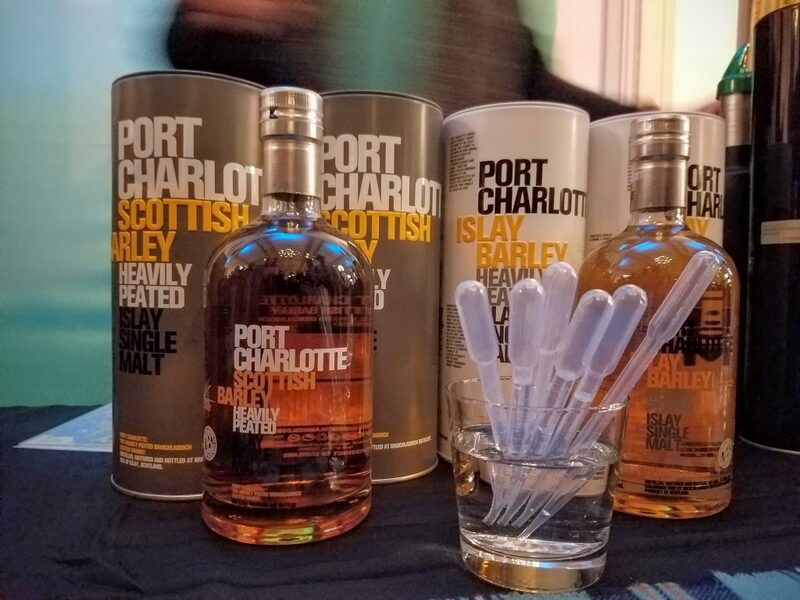 Next we tried the Port Charlotte Heavily Peated ‘Scottish Barley’ and it’s sister the ‘Islay Barley’. Again, the difference being where the barley was grown. 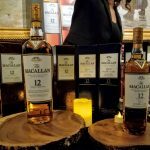 I was able to nose and taste distinct differences between these whiskies. Each had their own appeal. 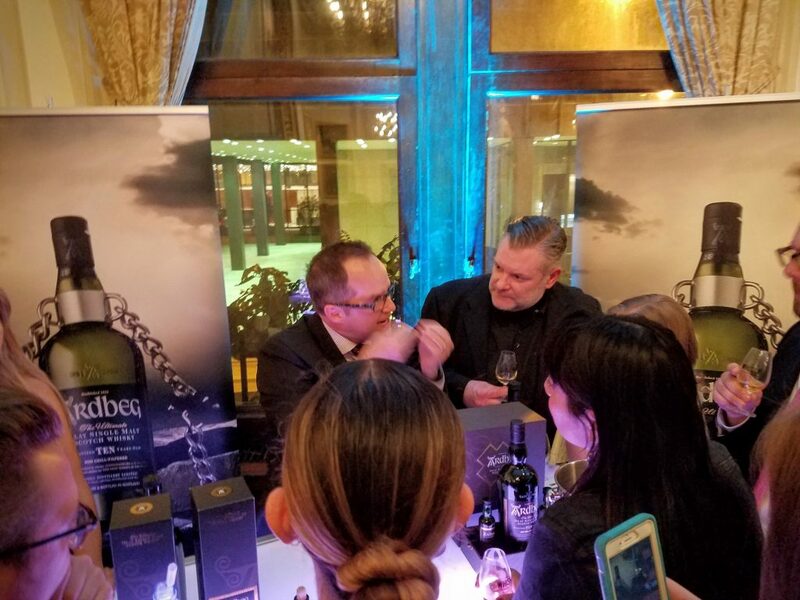 Ardbeg came next where we walked up to the brand rep giving an impromptu guided tasting for Michael Miller and his crew from Chicago’s famous whiskey hangout Delilah’s. 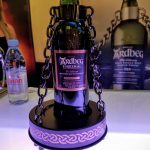 Ardbeg hails from the Islay region of Scotland. It’s a peaty, smoky, complex single malt with many awards behind it’s name. 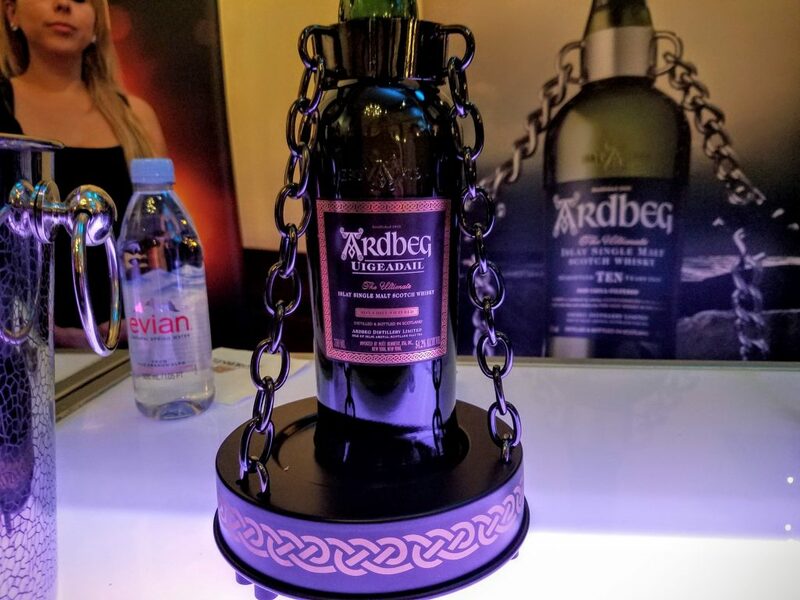 Displayed above is the Ardbeg Uigeadail, “a special vatting that marries Ardbeg’s traditional deep, smoky notes with luscious, raisiny tones of old ex-Sherry casks.”. 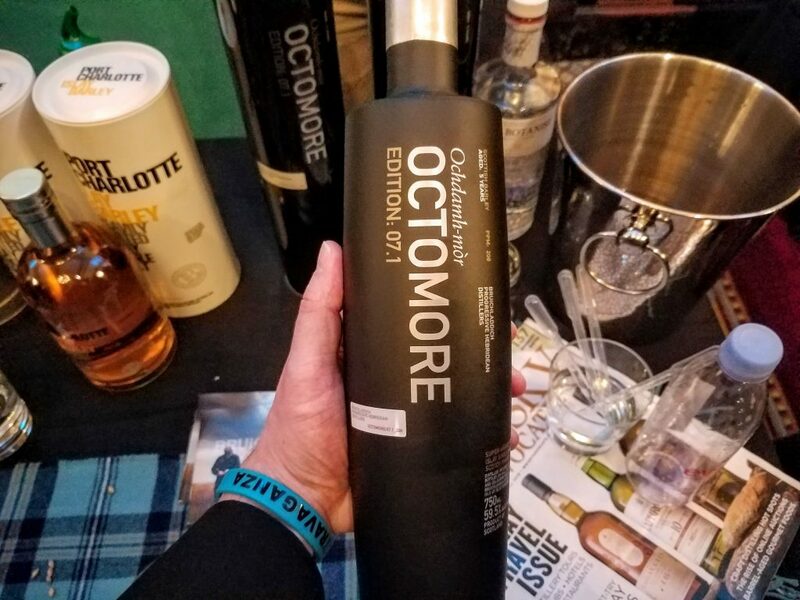 Our last stop was back to Bruichladdich to take on the peatiest Scotch in all the land, the Bruichladdich Octomore 07.1. 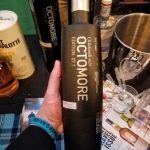 “For Octomore 07.1 barley harvested from mainland Scotland was peated to 208ppm. Five years in American oak. 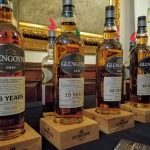 Bottled at 59.5%.” To give you a basis for comparison, “heavily peated” Ardbeg and Laphroaig releases come in at 40-50ppm. This truly does put Octomore in a league of it’s own! Going in I expected the extreme smoked peat to taste like chewing on a campfire log. What I experienced was not at all what I expected. There was a medium fruitiness up front followed by a taste that morphed into that familiar smoke in the finish. 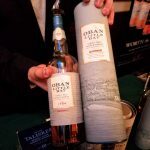 It was not at all overwhelming and exemplified the complexity that I look for in a whisky. This brings us to the end of our evening at the Whisky Extravaganza. 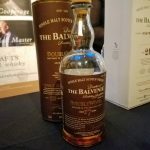 Being a seasoned Bourbon drinker without much interest in Scotch; I was pleasantly surprised by how much I enjoyed learning about and sampling Scotch. 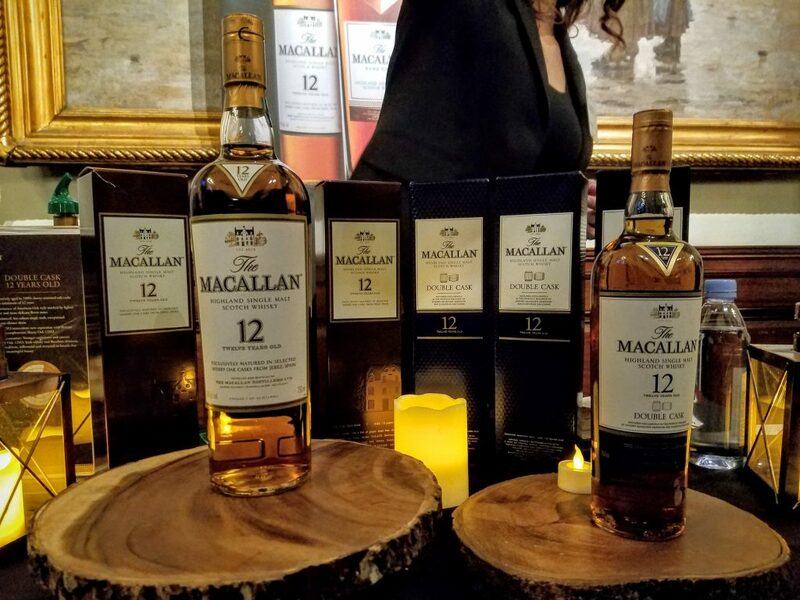 The event opened my eyes to the pillars of these brands as well as their unique offerings. 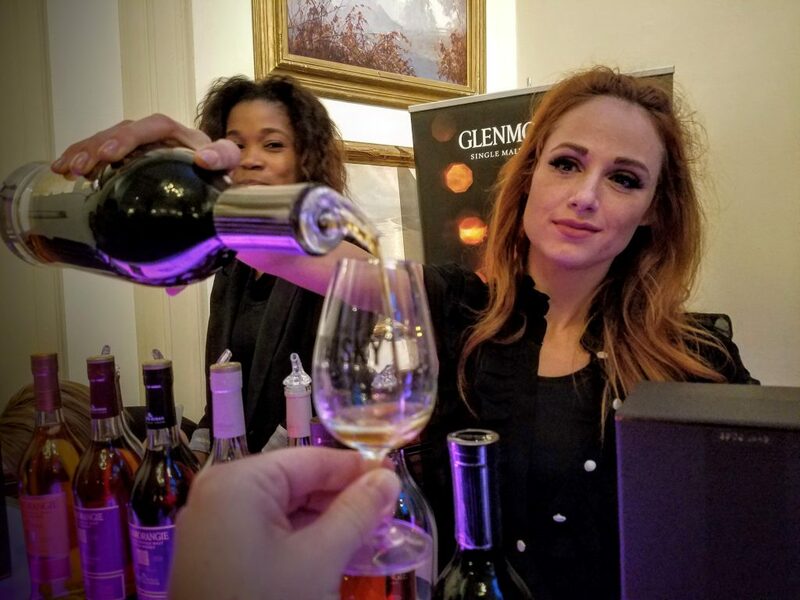 We don’t have any plans for “Chicago Scotch” but we do have an appreciation for the sister spirit and will likely be finding a place on our bar for a few bottles sampled at the event. 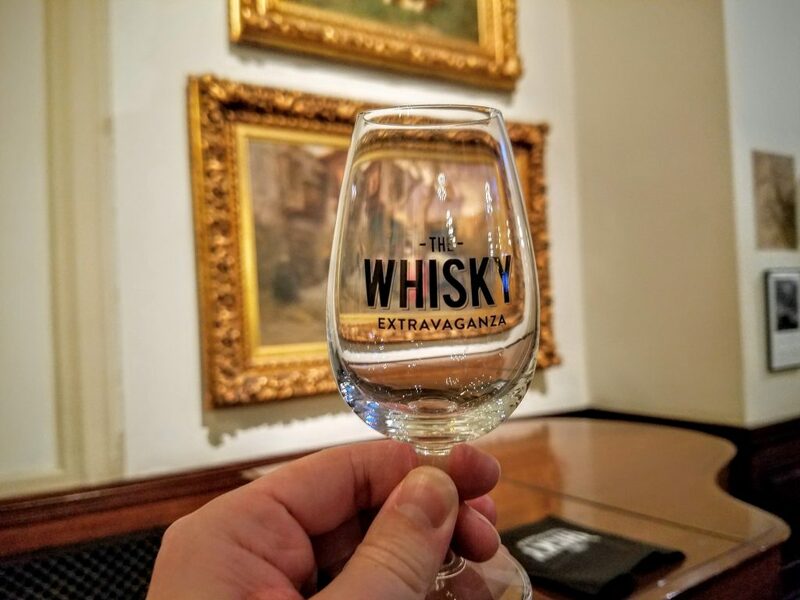 *In October 2016 the Whisky Extravaganza was acquired by London based IWSC Group. Next post Rye Whiskey Is Making A Comeback, But Can It Overtake Bourbon?